Prep the Salmon - Chop the salmon into tiny pieces. Mix it with the mayo, sriracha, and garlic. 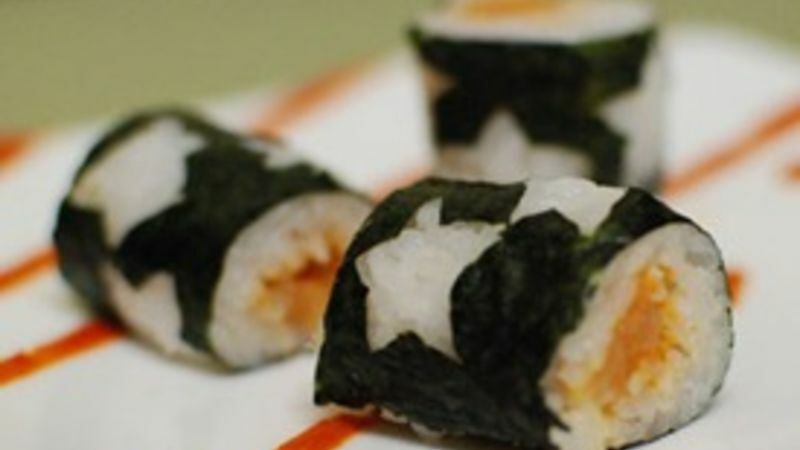 Prep the Nori - With an exacto knife, make tiny stars in the nori wrapper. Make sure to leave vertical lines with no stars so that later you can cut the roll with out damaging your designs. Make the Roll! - On a sushi roller, place the nori. Press out a thin layer of rice over the nori. Put your fillings on the rice and roll it up! Cut the individual pieces out of the roll and serve with some soy sauce.